The first chart shows a slight dip back towards 2009 and 2010 levels. However, I think this is an artifact of seasonality in angel investing. Comparing 1H2012 to 1H2011 for the angel data, there’s actually an increase of 7% from a $6.9B annual rate to a $7.4B annual rate. It’s just that 2H2011 had a $12.1B annual rate. I know of nothing specific that happened in the second half of last year to account for a spike, so my guess is that angel activity is just generally higher July through December. My prediction is that when the full year 2012 numbers come out in April 2013, we’ll see 2012 angel investing at slightly over $10B. Reported VC seed stage investing continues to drop (with my standard caveat that what VC’s call “seed” is probably different from angels). But it was made up for by increases in the size of super angel funds. 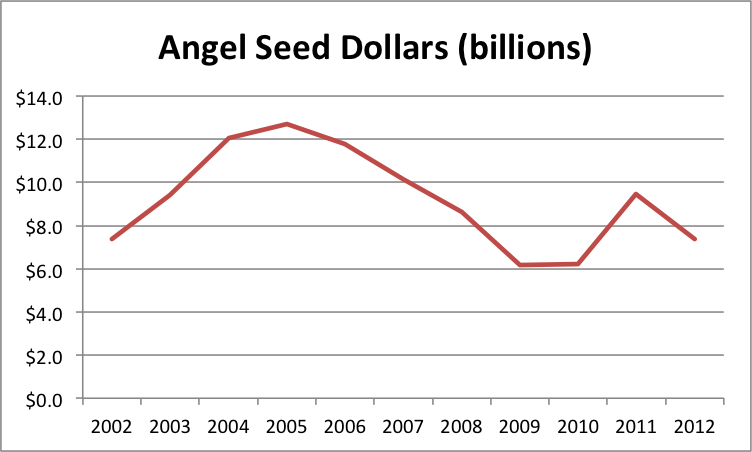 The obvious explanation is that super angels are taking over part of the VC seed function. I think there’s more to it than that, but substitution and specialization are certainly part of the story. Recall that I aggressively assume super angels deploy all their dollars in one year, to make my synthesized investment metric maximally sensitive to detecting bubbles. It looks like this assumption may not be too far out of line with reality. Aydin Senkut’s Felicis Ventures is raising a $71M fund after a $40M fund in 2010. Mike Maples’ Floodgate is raising $75M after $70M in 2010. Lerer Ventures is raising $30M after $25M in 2011. Ron Conway’s SV Angel is raising $40M after $28M in 2011. Chris Sacca’s Lowercase Capital is raising $65M after $28M in 2010. And finally, our big winner is Thrive Capital, raising $150M ($147M of which was already in the door as of 9/6/2012) after $40M in 2011. Given IA Ventures‘ big raise noted in our last installment, we’ve got two NYC new media funds blowing up. And it seems like a lot of the leading funds are on a 1-2 year cycle. I think this data supports my previous assertions that there is no general seed bubble in the US. However, it certainly seems plausible that Silicon Valley and NYC could have local bubbles given the increasing dollars going into super angel funds in those areas and anecdotal reports of high valuations. But my ad hoc conversations with people at the super angels indicate they are investing in a wide variety of locations. It’s possible that, at the margin, angels and super angels are choosing to invest outside of Silicon Valley and NYC often enough that we’ve reached an equilibrium. For the rest of 2012 and all of 2013, I think the big driver will be the overall economy. GDP growth was only 1.3% in the 2nd quarter and 2.0% in the 1st quarter. The 20-year average is 2.5%. So I don’t expect a big increase in seed funding until we at least get above that rate.